The Chinese Communist Party gathered about 2,300 delegates in Beijing from Oct 18 to Oct 24 to consider the country's future and to affirm a new batch of political leaders. As China's global influence grows, these party congresses will increasingly impact not just financial outlooks but also longer-term geostrategic relations regionally and worldwide. The 19th Party Congress, like those before it, marked a critical turning point for China's political cycle. Younger officials replaced up to half of the all-powerful Political Bureau and five out of the seven Politburo Standing Committee members. Most notably, the party elevated Chinese President Xi Jinping to a revered status on a par with Mao Zedong by enshrining his political "thought" into the party's Constitution. So what does all of this mean for investors, and how will it impact markets? While not much will change in the near term, the regime's economic initiatives and reform objectives are set to provide considerable investment opportunities in the years to come. While state presence in the economy will likely be strengthened and not diminished, certain sectors and markets could win big from the country's political and economic ambitions. This leadership reshuffle has two important implications: First, Mr Xi has further consolidated power within the party; and second, the current policy direction of reform and rebalancing will broadly continue in the years ahead. Now that Mr Xi has tightened control over the levers of the country, his major theme for the next five years will likely emphasise "getting things done". This is good news for investors because Mr Xi and his leadership team can now focus more on the economic agenda than on political manoeuvrings; the latter were distractions at times over the past half-decade. Mr Xi proclaimed that China has entered "a new era of socialism with Chinese characteristics" at the 19th Party Congress, ensuring that the country's economic direction will now be guided by this overriding policy framework. The foremost shift is in the conceptual approach to economic growth - rather than pursuing quantitative growth, which his predecessors encouraged, Mr Xi wants to achieve "quality" growth. As such, he reiterated the need to further reduce overcapacity and leverage, and the importance of a market economy and state-owned enterprise reforms. Deeper supply-side structural reforms will likely serve as a critical part of China's ongoing economic transition. Mr Xi also reaffirmed his pledge to double per capita GDP by 2020 from 2010 levels, and laid down targets for China to become a "fully modernised" socialist state by 2035 and a "leading global power" by 2050. Concrete policy initiatives will now follow at the National People's Congress, which convenes in March 2018. Given Mr Xi's economic goals, the government will likely continue to pursue a reasonable GDP growth rate of above 6 per cent per annum over the next three years - a pace that should yield a healthy environment for financial markets. Other important areas that have received a surge of attention are the environment and technology, two sectors poised to benefit directly from China's political priorities. Mr Xi called for continuous "green development" and reiterated that "clear waters and green mountains are as good as mountains of gold and silver". Already, pollution limits and production curbs on various metals are being put in place across many cities in China - look for industrially oriented metal (copper, aluminium and tin) prices to rise as a result. And more policies covering green manufacturing, clean energy and green finance are likely to come out at later party gatherings. Meanwhile, cultivating home-grown innovation has become a high priority for the party. Chinese leaders view the country's ability to innovate as an essential component of its long-term prosperity and stability. The "Made in China 2025" initiative, unveiled in 2015, received a jolt of support at the 19th Party Congress, as the government plans to boost the country's industrial capability via favourable policies. Several strategic sectors have been earmarked for support, including advanced IT, robotics, aerospace, new-energy vehicles, new materials and medical devices among others. Another growing emphasis is on expanding China's regional and global influence. Central to achieving this aspiration is Mr Xi's Belt and Road Initiative (BRI), which will be accorded the highest priority as China's global might grows. This ambitious plan aims to establish outbound trade and investments along China's trade routes through a combination of five railway links and maritime sea routes, connecting Asia, Africa and Europe. The BRI covers an aggregate population of 4.5 billion, or 63 per cent of the world's population, with a total economic output of US$27.5 trillion (S$38 trillion), or 35 per cent of 2015's global GDP. The massive scope and scale of the BRI will take many years to materialise, but China's commitment to jump-start funding of its projects could greatly benefit the participating nations and companies. Laos and Thailand will likely be among the first beneficiaries of the BRI, given their strategic location between China and the richer South-east Asian countries of Singapore and Malaysia. South-east Asian infrastructure companies, capital equipment makers, select banks, property developers and Chinese contractors will also likely be at the forefront of the BRI. The 19th Party Congress in itself should have a minimal near-term impact on the financial market. 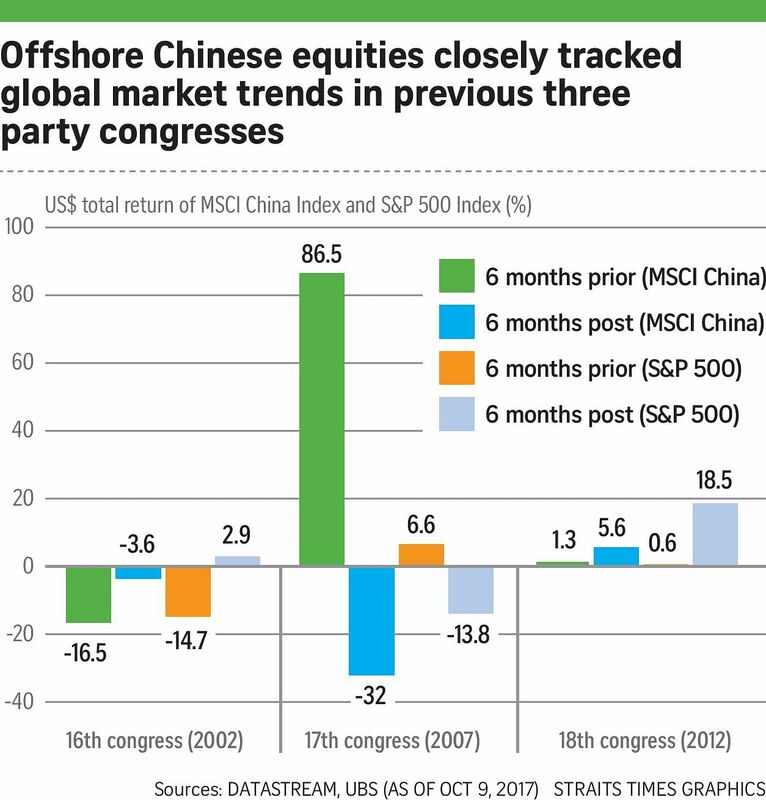 During the six months before and after the last three party congresses, the MSCI China Index largely tracked the direction of US equities instead of specific Chinese policies (see chart). Still, the strategic imperatives revealed speak for a policy continuity which helps underpin the stability and the ongoing health of China's economy. We remain overweight on Chinese equities and believe the macro stabilisation amid the political transition will power cyclical earnings and share price gains in the coming months. In the longer term, sectors and companies linked to the Chinese government's strategic priorities of innovation and reforms should ride high on favourable government policies, making them clear favourites for strategic investors. •The writer is the Asia-Pacific regional head at the chief investment office of UBS Wealth Management.